A Persian Khoresh with French Fries! Well, today I have for you the recipe for a wonderfully crowd-pleasing Persian khoresh made with cubed meat and split peas and limoo amani and potatoes that is called khoresh ‘e gahimeh sibzamini – or as my nephew calls it “French Fries Stew.” If our relations with France begin to suffer, first I will cry bitterly as I am a devout Francophile, but then after I pull myself together we can regroup and commence to rename the khoresh to Freedom Fries Stew. So no worries! Anyhow, as a French Embassy spokeswoman stated (rather condescendingly I might add … so French!) fries are, in fact, Belgian. Belgium has never provoked ire to any nation I believe. So, really, no worries! As with every other type of Persian stew, khoresh ‘e gaimeh sibzamini begins it wondrous journey with making a batch of piyaz dagh (chopped onions fried for 12-15 minutes till they are golden and translucent and caramelized but also somewhat crispy and yes onion can become all these things simultaneously!) and then browning the meat in the said piyaz dagh. Once you get the hang of both of these things, you’re pretty much well qualified to tackle almost every type of Persian khoresh. Here in the East coast, it generally takes 70-75 minutes in total to cook khoresh but the cooking time (meat and even split peas) for Khoresh is longer in Tehran (nearly 2 hours) since temperature there is dry and not humid. 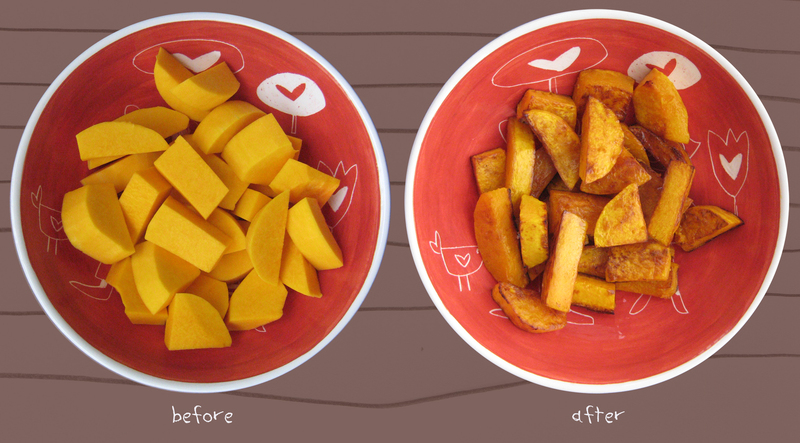 The thickness and quality of pots and pans have an impact as well. Accordingly, as you cook Khoresh do keep an eye out and make a note of the perfect timing per your geographic location and other factors. Oh dear Lord! Let’s make polo khoresh gaimeh sibzamini and let’s dig in! As promised let’s cut to the chase and click our heels and then click on the link below to continue to read the recipe! Hi everyone! As we speak, I’m off on my excellent adventures in Iran, but my mom and I made this khoresh earlier and I scheduled it to post now. Hope you’ll like it! 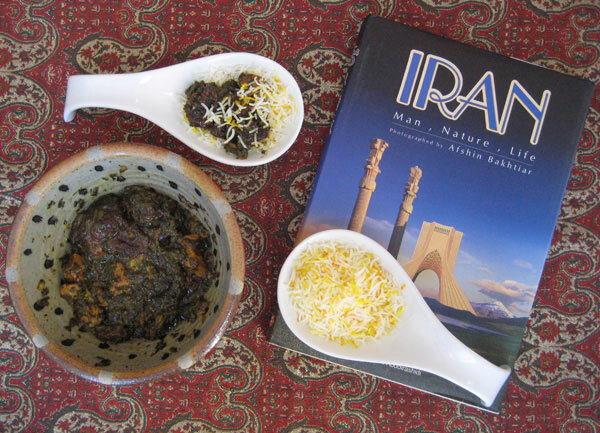 You may recall that Khoresh is the quintessential pillar of Persian cooking – a genre of food that encompasses an eclectic variety of tastes and flavors. More elaborate and sophisticated than a typical stew, khoresh is a slow-fusion combination of meat (or poultry or fish) cooked with fresh or dried fragrant herbs and vegetables, or fresh or dried fruits, grains, or legumes. 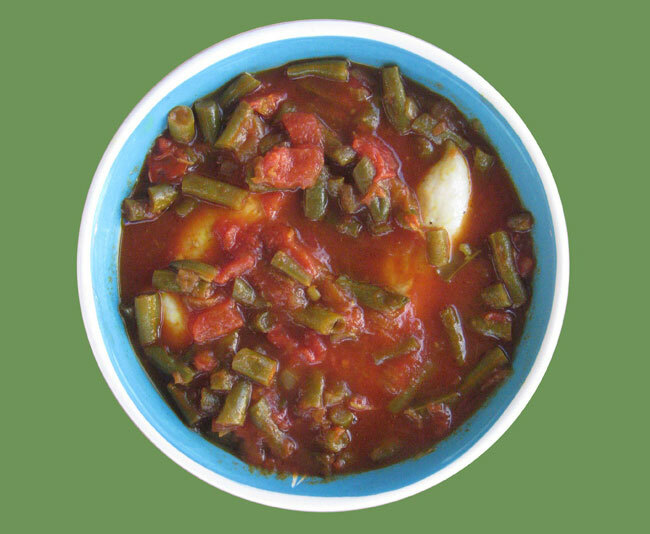 This recipe is for a type of khoresh known as aloo esfenaj – although some call it the other way around: esfenaj ‘o aloo. It is made with lots of esfenaj (spinach) and also plenty of aloo (plums.) 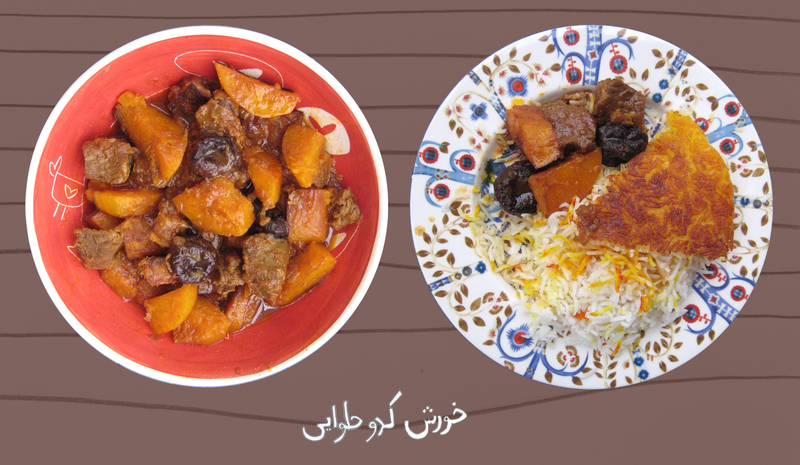 Typically, the type of plums used for the khoresh aloo esefenaj are dried yellow ones known as aloo bokhara , but prunes (dried black plums) are a common substitution, specially outside of Iran where aloo bokhara are not easily found. My mother reports that my grandmother used to often make khoresh aloo esfenaj — and it is one of my mom’s favorites. It is one of my favorites types of khoresh as well. 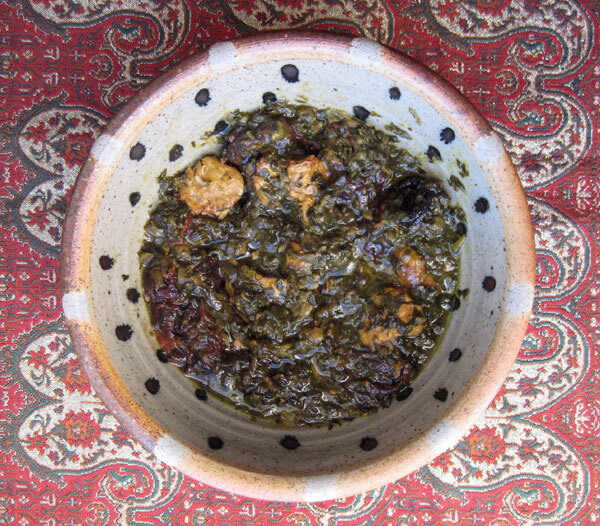 There’s something undeniably luscious about the combination of cooked prunes, spinach and meat — with that signature flavor profile of Iranian food of being harmoniously savoury, tart and sweet all at once. As notoriously complicated as Persian rice is to make, Persian stews make up for it by being quite forgiving and easy going, and this delicious khoresh is no exception. In the spirit of keeping things short and sweet, let’s click our heels and head straight over to the recipe. 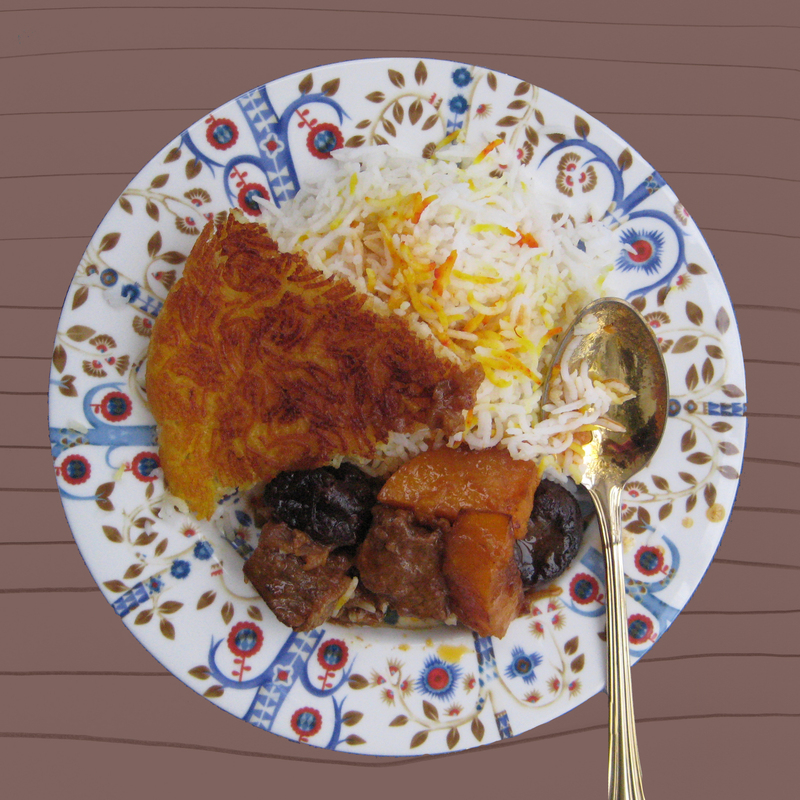 Plain Persian rice or polo is almost always paired with a type of khoresh, thus forming a formidable entity known as polo-khoresh. Just think of the pair as the Brangelina A-list power couple of Persian cuisine. There are many different types of khoresh – one more delicious than the next – and according to my mom, they are “one of the easiest things ever to make. ” Easy for you to say, mother! But seriously, it’s true that typically, the hardest part of making a delicious Persian stew is the prep work. I guess khoresh, easygoing and magnanimously forgiving of faults, makes up for Persian rice being such a temperamental … let’s say diva. A very delicious khoresh, one that I recall being on heavy rotation in our household, chock full of herbs and with that typical Iranian food signature flavor of bright tangy notes plus savory succulence is khoresh ‘eh karafs or celery stew. True to my mother’s word, it is easy to make. Just chop chop chop; sautée; simmer. Basically. Pretty much. In a stunning display of brevity, I’ll now cut short the banter and point you to the recipe where all is explained. I will only add one other thing: this is worth making. Trust! 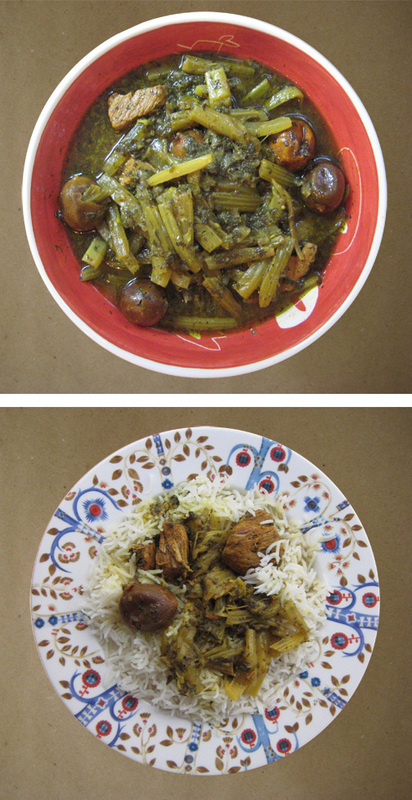 Khoresh is Farsi for stew – you may recall. 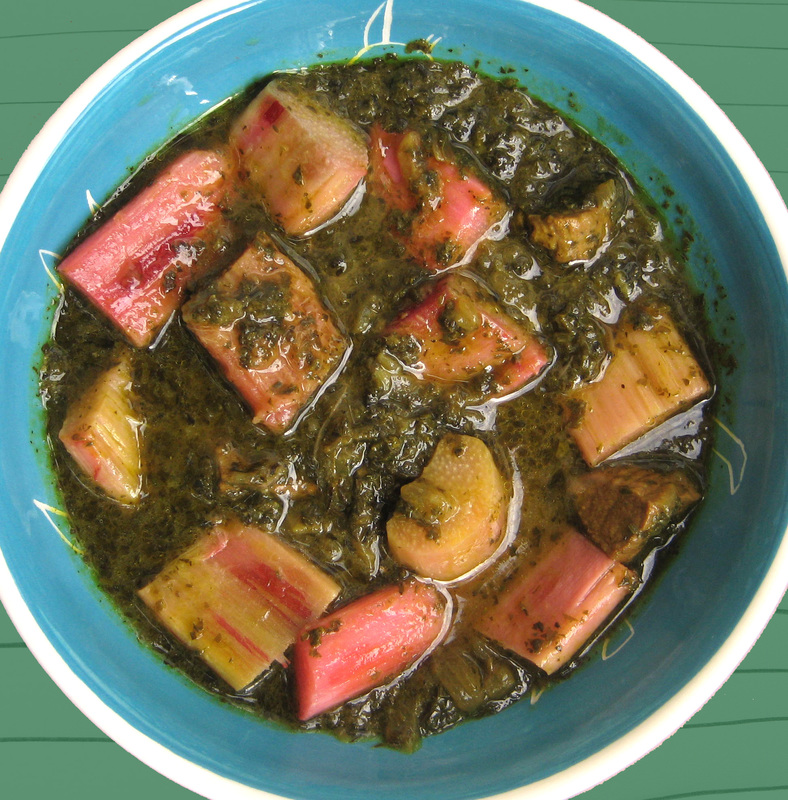 A few posts ago we made a gorgeous rhubarb stew (modesty: out the window!) and the festive concoction pictured above is another type of Persian stew called “khoresht’eh kadoo halva’ee” which translates into “butternut squash stew.” But let’s instead nickname it “Halloween Stew” in honor of that very awesome and very American holiday of ghosts, goblins, candies, and costumes. It seems an appropriate nickname. 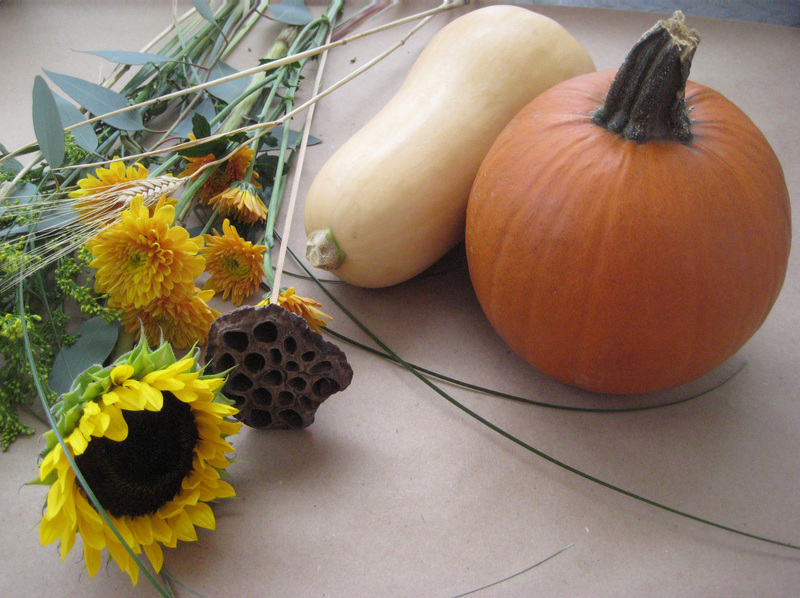 After all, a butternut squash is kissing cousins with the pumpkin; tastes like candy when cooked; and the orange color of its flesh is the trademark color of Halloween. Just like its namesake holiday, a Halloween Stew is childlike and all grown-up at the same time: there is the sweet-as-candy butternut squash taste but then there are prunes involved! The flavoring of this stew is something lush: as is the wont of Persian cuisine, there are many contrasting notes of texture (soft and chewy and mushy) and flavor (earthy, sweet, mildly tart) whirling and combining to form a frighteningly pleasurable dining experience. I’ll keep it short and sweet this time and skip (just after this one pic) right along to our haunting Halloween Stew recipe.This is no trick. Just a treat. Khoresh is a genre of Persian food that is not merely a staple but also a quintessential pillar of Persian cooking. Widely translated as “stew”, Khoresh is certainly stew-like or stew-ish, but it is more elaborate, deliberate, and dare I say dignified than stew. Let’s put it this way: if Bill Clinton were khoresh, then his brother (Roger Clinton) would be stew! Same family, close relation, many things in common, but… big difference. There are so very many different types of khoresh that initially Maman and I were flummoxed fixing on which one to choose as Fig & Quince‘s inaugural khoresh post. …and that a “Khoresh rivas” or rhubarb stew is not good. It is amazing. Pieces of succulent rhubarb and tender meat in an aromatic herb-infused pool of tart and savory flavors. Delicious, sophisticated, inviting. 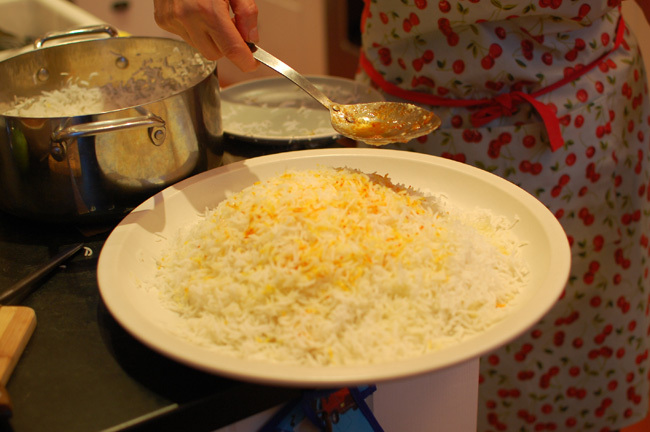 Khoresh is always served with rice but due to technical difficulties, we lost the mouthwatering rice-and-khoresh pictures, so we’ll have to implore you to use your imagination and conjure this: a bed of fluffy rice, steaming fragrant with saffron and a hint of butter. Lean in close and take a good inhale. Why not, it’s nice! 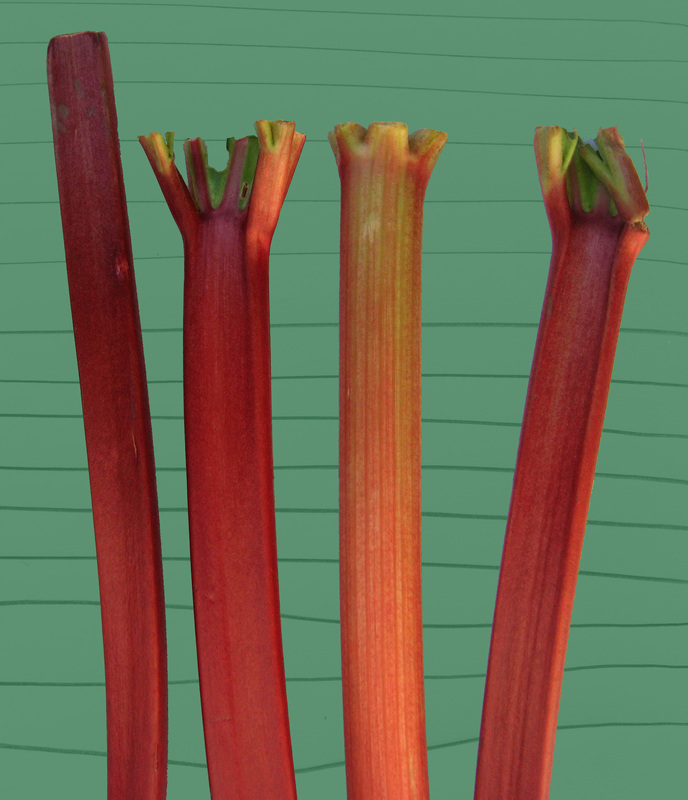 Now take a generous ladle or two of the rhubarb stew and pour over the rice. 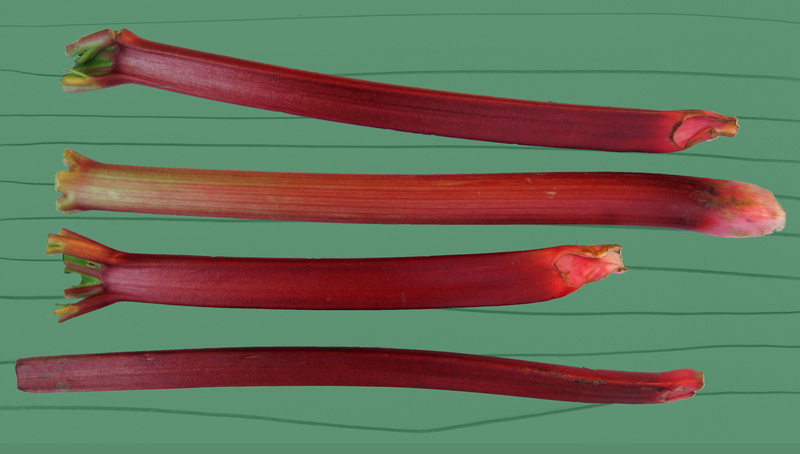 Make sure you get a good bit of juice and a few good pieces of rhubarb and meat. Now mix your rice and khoresh, and take a spoonful to eat. Pause mid-way in anticipation of that first (always best) taste. Linger over this mental image and enjoy. This (tormenting) exercise reminds me of a saying in Farsi which goes: “vasf ol aish, nesf ol aish” which roughly translates to “talk of a pleasure is half of the pleasure.” I don’t know if I agree with the sentiment, and here’s the recipe so that you can savor all (instead of half) the pleasure of the incomparable Persian rhubarb stew. Greetings friends! Spring has sprung in full bloom here – the “golden waterfall” and “wisteria” and myriad other flora are blooming in earnest all over Tehran – providing beauty and pollen and allergens. I never enjoyed any allergies whilst on the coast of East, but here in the Eastern world, I am totally prone to itchiness and sniffles. Oh joie! Seeds! When spring is but a promise! 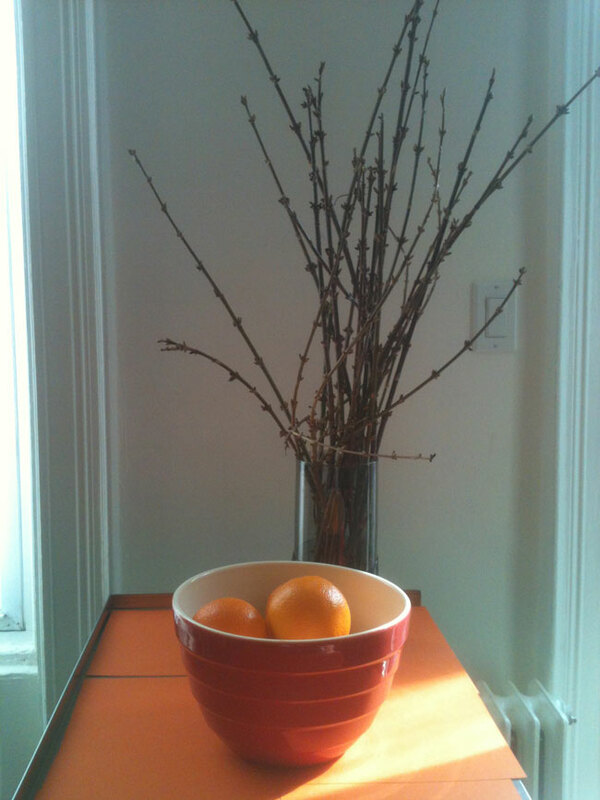 Red Wheat on Orange to sprout Green! 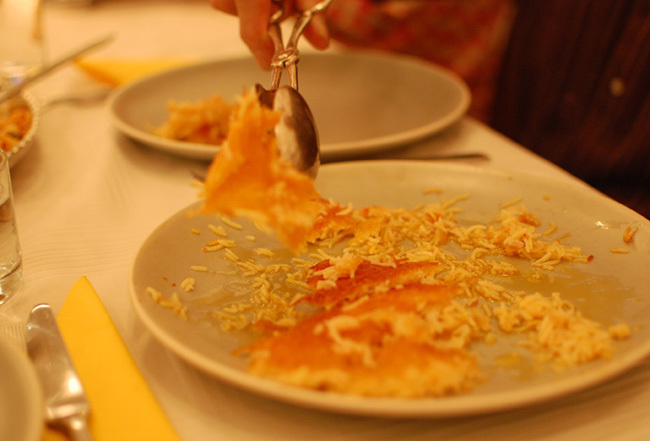 grated cantaloup for yummy paloodeh talebi! Recently I craved decluttering — a veritable urge to get rid of extra and extraneous stuff that extended not just to physical things but also my thoughts (getting all deep and philosophical on you here and progress report is that the abode of my thoughts still needs a good and proper and vigorous khoneh takooni and maybe even refurbishing) and also all the computer and digital stuff and junk as well. I don’t know about yours but my computer desktop and folders — bulging and busting at the seams — were in need of a good non-sentimental editing. The process of feng shuing my digital life has been a fun, comforting, purifying, unnerving, daunting and overwhelming endeavor all at the same time! Fraught with fussy deliberations! Is it best to save beaucoup MBs and delete a bunch of slightly different versions of a photo in a series, or do I risk ruing the day in the future where one or more of these would have been perfect and by then it’s too late and they are in that big cyber trashcan up in cyberheaven? Mostly, in my zest, I’ve answered this modern philosophical dilemma with brutal keystrokes of destruction: control+Q! Deleting with gusto! It has not been all annihilation, however; the counterpart of the editing journey has been getting reacquainted with forgotten scribblings (oh when will I ever get to organize and purge those) and lots of photos that I really like but have never used. I thought I’d share some of the pix with you. Hence this post. A post which may become a series. Who knows. I’m juggling way too many series over here as it is. So as this is not being entirely random, we have a theme: orange! Gentle reader, hello and welcome to part 4 of the Trip to Kermanshah series! I omitted mention of the thriving farmer’s market bustling with all manners of fresh fruit and vegetables and herbs just outside and around the bazaar. Saving its tale for now. And this is freshly harvested chickpeas! Roots & all! Back tracking a bit, and as I pointed out recently, you may by now have noticed a pattern with Persians and their passionate penchant for unripe produce! Let’s just go ahead and call it an impetuous love affair! To wit, we have unripe almonds (chaghaleh badoom چاقاله بادوم ), unripe green plums (gojeh sabz گوجه سبز), and just recently we made the tart yet invigoratingly pleasant acquaintance of unripe sour grapes (ghureh غوره) all of which are specimens of things not yet ripe yet beloved by Iranians and consumed with relish as either a fruit snack, or as a cherished culinary ingredient, or for its medicinal benefits, or for all of the above. 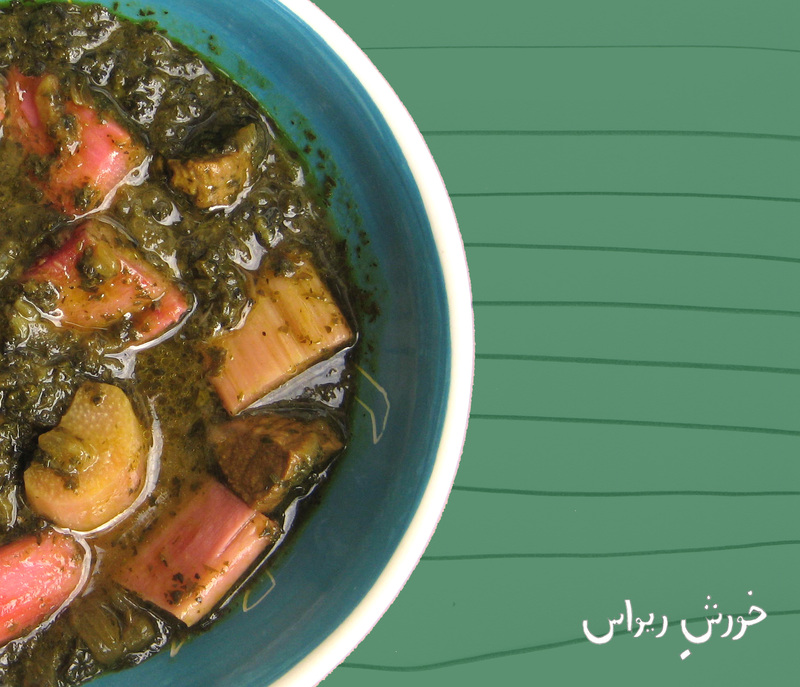 While writing about ghureh I did wonder if I were missing any other unripe fruits and vegetables that have sweet-talked their way into the Persian palette, and while writing this post I realized I’d forgotten about at least one more such instance. During the tour of Kermanshah’s farmer’s market I came in close contact with mountain grown wild pistachios called vanooshk ونوشک and I was also tickled to find out about the nibbling possibilities of freshly harvested chickpeas! I was walking and talking with my cousin Roshanak but out of the corner of my eyes I couldn’t help but notice this lady munching off what appeared to be torn off tree branches! WHAT! Inquiring minds want to know and I played my tourist card and before my cousin could stop me, pounced on the poor woman and asked what she was nibbling on. As was wont of almost everyone I interacted with during my trip to Iran, the lady was super nice and friendly and warmly informed me that she was enjoying snacking on freshly picked green chickpeas or nokhod kham as we call it in Farsi. The freshly-harvested-chickpeas-snacking-nice-lady offered me to try some of the nokhod ‘e kham and I confess I was not shy enough to refuse and I heartily agreed to pick and munch. I no longer recall the precise taste but I do remember that the green chickpeas were kind of crunchy and overall: pleasant. Certainly a most intriguing way to snack! Afterwards, my cousin Roshanak laughed and said “Vai, Azi jan, chera inkaro kardi? You shouldn’t eat unwashed things!” But you know what, I pretty much threw caution to the wind during my trip, or rather, I was not even conscious of the need to be cautious, to be honest. I ate and drank what was offered and was available or seemed novel, tempting or interesting and it was all good and I lived to tell the tales! And I do have a few fun tales left to tell in that regard! Before leaving the bazar’s farmer’s market, Roshanak wanted to buy something. A little something called vanooshk! Here’s a mound of vanooshk, piled high. It bears a striking resemblance to unripe sour grapes, n’est ce pas? What is vanooshk? Well, it is the fruit of a tree called “baneh” that grows in the mountains of Iran. 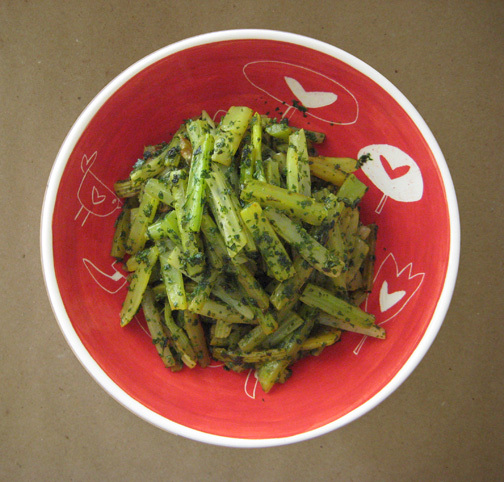 In Farsi, vanooshk is also known as wild pistachio or mountain pistachio. In English the tree is known as the Persian turpentine tree and if you want to get all Latin about it, the tree is called Pistacia atlantica. To the best of my knowledge, vanooshk is not nibbled on raw, but is used to make everything from torshi (Persian pickles) to ash and abghoosht (thick hearty Persian soups) to khoresh (Persian stews.) At least, Kermanshahi folks do so. My visit was not long enough for me to taste any of these culinary marvels. Alas! My cousin Roshank has a beautiful bagh (a term referring not to a farm per se but a piece of land, private garden, used strictly to grow fruits and vegetables) and before I left Kermanshah she made sure to give me a tote bag packed and filled with freshly picked grape leaves from the trees of her own bagh that I took with me to Tehran, as one of the many sweet and charming souvenirs of my trip to my father’s city of childhood. … who was a little grumpy at first but hammed it up like a champ when I asked him to pose with a vanooshk bouquet. Damesh garm! Back soon with the next installment of this Trip to Kermanshah series. My Persian Culinary Feast Workshop! Persian rice! The stuff of culinary dreams! You guys, this post is nothing more than a shameless plug for a Persian cooking class workshop that I’m offering on August 23rd in the merry state of Maryland. If you’re going to be in the DC area that day, do come, won’t you? I’m calling the class a “Persian Culinary Feast Workshop” which is a mouthful but it’s apt because it will yield much delicious mouthfuls, and will cover a few essential genres of Persian cuisine into the bargain. 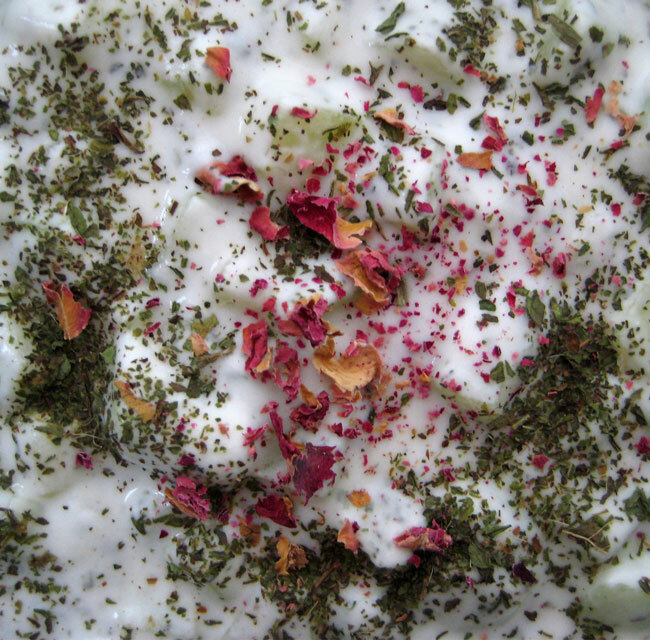 Persian Rice 101; green bean khoresh; Persian cucumber & mint yogurt soup; doogh; and we’ll end on the heady note of how to hack a plain vanilla ice cream into a sensory overload that is the delightful Persian saffron, rosewater & cardamom ice cream with pistachio slivers. Here’s the link to the Eventbrite page for more info and to register. Register, mark your calendars, and rev up your tummy + taste bud engines. May I please ask for your help in spreading the news of this class? I would appreciate it greatly from the bottom of my shekamoo heart if you could please pass this info along to your Washington DC area friends or family who might be interested.